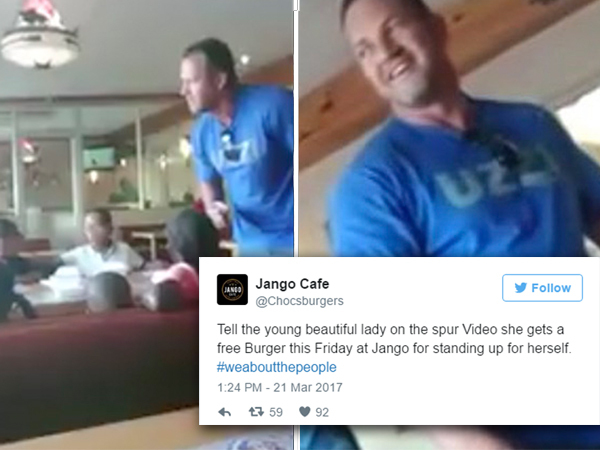 After a video showing a man physically threatening a woman in front of his and her children at a Spur restaurant went viral on social media, Twitter users reacted with shock, with some defending the man. Spur restaurants nationwide banned the man from their eateries after an apparent scuffle between children in the play area of the Texamo Spur at the Glen Shopping Centre, south of Johannesburg led to a confrontation between the parents. The man is heard telling the woman that her daughter had hit his son on the head, which he apparently witnessed through the window of the play area. The mother counters that the child is tiny, telling the man that she won’t allow him to bully her. He tells her to do something about what happened, and she tells him to “just f*** off”. The man then appears to stop himself from smacking her, saying, “Ek sal jou ‘n poes klap gee”, and also tries to overturn their table. Spur in a statement described the incident as “unfortunate”, saying that the mall security was alerted when the incident escalated. The views on Twitter ranged from support for the mother, support for the man, or criticism of Spur.